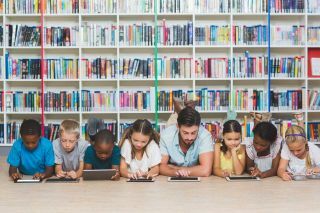 Follett and children’s book author Kwame Alexander today announced they have formed a partnership to launch All Books for All Kids, a literacy campaign to ensure all children have access to a wide range of books. The partnership will be formally introduced Saturday (Oct. 13) in Miami, where Alexander is touring to promote his new book, Swing. The partnership teams Follett – provider of educational materials and technology solutions to PreK-12 libraries, classrooms, learning centers and school districts in the United States – with Alexander, a New York Times Bestselling Author, Newbery Medalist, global literacy advocate, and Founding Editor of Versify, the new publishing imprint from Houghton Mifflin Harcourt. Alexander will curate the content for the campaign, which will feature his works plus a collection of new artists and authors. “Follett and I both believe in All Books for All Kids and together we’re going to introduce kids to books they may have never have thought of reading, books that will entertain and enlighten, books that hopefully will help them imagine a better world and their role in making it so,” said Alexander. For more information about Follett, visit www.FollettLearning.com. For more information about Alexander, visit https://kwamealexander.com.